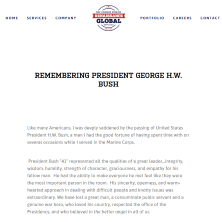 President Bush “41” represented all the qualities of a great leader…integrity, wisdom, humility, strength of character, graciousness, and empathy for his fellow man. He had the ability to make everyone he met feel like they were the most important person in the room. His sincerity, openness, and warm-hearted approach in dealing with difficult people and knotty issues was extraordinary. We have lost a great man, a consummate public servant and a genuine war hero, who loved his country, respected the office of the Presidency, and who believed in the better angel in all of us.